Liquid Proust Teas has provided me with Peach vs. Bergamot for the purposes of providing an honest review. I was more than a little bit excited about this tea when I read the name because I really love Earl Grey teas so anything with bergamot oil gets me excited. Opening the bag to take a sniff, the first thing I can smell is peaches and it smells sweet – it reminds me a lot of fuzzy peaches candy. The underlying scent has some citrus notes to it, which I would think is the bergamot but it doesn’t pack a wallop like in some Earl Greys that I’ve had before. This is a lot more subtle, since the peach scent is definitely overwhelming the bergamot. If this was an actually some kind of match between peach and bergamot, I would say that peach is already winning in the fragrance department! Peach vs. Bergamot contains: Formosa oolong, marigold, and flavouring. Without more information, my best guess is that the flavouring includes peach and bergamot. 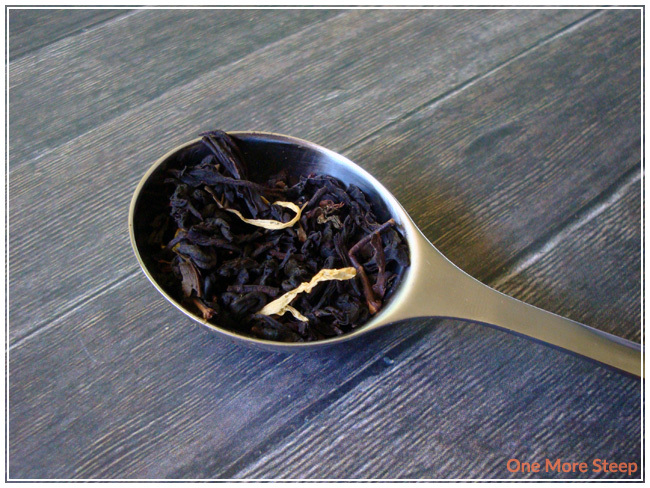 The marigold is easy to pick out, the oolong has subtle twists in the leaves. They are an amazingly dark colour though, and the flavouring stands out to the point that it is overwhelming to the natural fragrance of the tea. Liquid Proust Teas recommends steeping Peach vs. Bergamot in 185°F (85°C) water for 3 minutes, I steeped for about 3 minutes. Peach vs. Bergamot is a beautiful, clear golden brown colour and has a very light peach fragrance. I don’t really smell any bergamot, but the peach is very nice. With the first sip, the peach flavour is subtle and the oolong flavour comes out quite well despite it being hard to smell when the tea was dry. The tea is pleasant – smooth, no bitter notes. The peach flavouring is a quite nice pairing with the oolong. 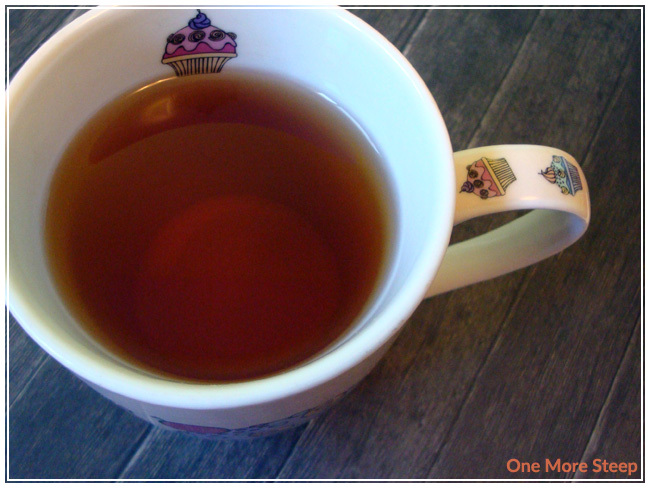 Because the flavouring isn’t overwhelming, oolong comes out in tea after steeping. I don’t really get any hints of bergamot flavour though, there’s no punch of citrus that I am used to from Earl Grey, but the peach is so pleasant that I don’t even care that I can’t taste the bergamot. Steeping Peach vs. Bergamot again, most of the light peach flavour is gone and I get the full effect of the oolong. It actually resteeps quite well, despite not tasting the same. The second (and also third!) 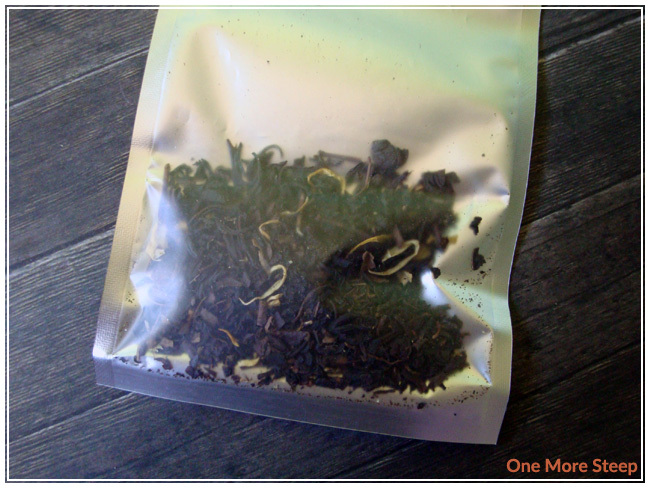 steep of Peach vs. Bergamot brings out more of the straight oolong taste as most of the flavours are gone. Because the flavour changes so starkly, it’s almost like getting to try a whole new tea. I loved Liquid Proust Teas’ Peach vs. Bergamot. In a battle between peach and bergamot, peach is the winner – but the clear champion overall is the oolong. The peach flavouring lasts well for the first cup, but each subsequent steep brings out more and more of the oolong and it’s a beautiful flavour. I think the first steep would also make a really nice iced tea, the delicate peach flavour lends itself well to a tea for summer and would probably taste fantastic with some ice, maybe a fresh sprig of mint. Hot though, the tea is great and I love the changes in flavour as the oolong comes out.